If you live in the Hamilton area and are looking for a used motorcycle, visit a Budds’ Motorrad near you today. Our Oakville location proudly offers a great selection of premium pre-owned motorcycles. If you are looking for a used motorcycle, browse our website to view our online gallery and check out our exceptional selection of motorcycles that we have in stock. You can browse our selection of motorcycles, maxi-scooters, equipment, or even connect with our community at Budds’ BMW online. Simply select “Motorcycles” in our user-friendly drop-down menu to find our selection of used motorcycles available to the residents of Hamilton. At Budds’ BMW, our BMW Motorrad premium selection allows you to choose which used motorcycle suits your lifestyle needs. If you live in the Hamilton area and are looking for a used motorcycle, our interactive website offers a selection of motorcycles listed by region of origin. If you prefer an international motorcycle, you can browse our selection of bikes from Italy, Switzerland, France, the Netherlands, Japan, Russia, the United Kingdom, and of course, Germany. All of our bikes are in immaculate condition, as we have each vehicle thoroughly inspected before it enters our Oakville showroom. Each pre-owned high performance motorcycle is certified, so you can rest assured that you will have access to the complete history of your dream motorcycle. All of our pre-owned motorcycles come with a warranty and 24-hour mobility service. We take quality and safety very seriously at Budds’ BMW Motorrad. When you’re shopping for a used motorcycle in the Hamilton area, be sure to visit Budds’ BMW Motoradd in Oakville. We would love to provide you with a test drive experience that will be memorable and enjoyable, and ensure that you drive off of our lot with the motorcycle that best suits your style. Style doesn’t just end with your bike though! At Budds’ BMW Motorrad in Oakville, we have a great selection of equipment to accompany your bike so that your look matches your bike. Whether you’re looking for accessories or parts for your bike, we have it all here at our Oakville BMW location. 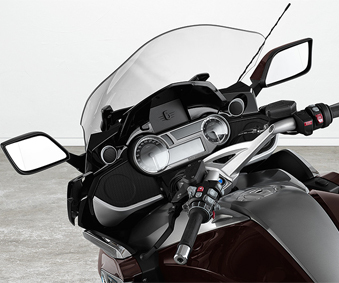 If you’re looking for navigation tools for your BMW motorcycle, our options are virtually limitless. Also, be sure to take a look at our custom top quality carbon helmets that look amazing and provide you with a light fit so you won’t be weighed down while on the road. Book a test drive appointment online or give us a call at Budds’ BMW Motorrad Oakville today. We’re here to help you find the motorcycle you’ve always been hoping for.